Record sleeve for ‘Paint It Black’ single issued in South Africa, 1966, with B-side, ‘Long Long While’. Click for Amazon single. In the spring of 1966, all was not well in the world. The Vietnam War was raging and American involvement there was escalating. U.S. troop strength had reached 200,000 by then, and draft quotas at home had doubled. Earlier that spring, in April, U.S. Senator J. William Fulbright (D-AR), one of the few Senators challenging U.S. involvement in Vietnam, had given his famous “Arrogance of Power” speech at Johns Hopkins University, critical of the “might-makes-right” approach and more, aimed squarely at the U.S. In Vietnam, meanwhile, the military government of South Vietnam under Premier Ky was doing battle with Buddhist rebels in Da Nang in mid-May. China at this time had made its Cultural Revolution pronouncement. Despite these woes, the day-to-day rhythms of life went on as normal throughout much of the world. In America, Vice-President Hubert Humphrey and U.S. Secretary of the Interior Stewart Udall dedicated the new Gateway Arch in St. Louis on May 25th, 1966. Busch Stadium, home to baseball’s St. Louis Cardinals, had opened there earlier that spring. In the world of boxing, late May, Muhammad Ali, then known as Cassius Clay, would knock out the U.K.’s Henry Cooper in a six-round heavyweight match in London. Young Rolling Stones shown on German single, 1966. In music, the Beach Boys had released their Pet Sounds album, and Bob Dylan his Blonde on Blonde album. About that time as well, around mid-May 1966, a new song titled “Paint It Black” by the British rock group the Rolling Stones, began to be heard across the U.S. and in the U.K. It was one of those hard-driving rock ‘n roll tunes from this raucous new group that was catching on in a big way. “Paint It Black,” written by Mick Jagger and Keith Richards, is not a happy tune in its lyrics, but in 1966 its musical appeal pushed it to the top of the pop charts. Released as a single, the record reached No. 1 in the U.S. and the U.K. in late May, holding the top position for two weeks or so. It remained in the Top 40 for ten weeks through the summer. The song became popular throughout Europe and around the world. The Rolling Stones by this time already had two big breakthrough hits in 1965 — “I Can’t Get No Satisfaction” and “Get Off of My Cloud” — along with two top albums that year; Out of Our Heads and December’s Children. Their third album Aftermath, which included “Paint It Black” in the U.S version, was also a hit. 'Paint It Black' single sleeve, Italy, 1966. “Paint it Black” would become one of those songs from the Rolling Stone’s catalogue that would enjoy a second and third sales life, in some cases, 30 and 40 years after its initial release. It would be re-issued as a single on at least two other occasions — once in June 1990 when it hit the U.K charts for three weeks, and again in May 2007 when it hit the U.K. charts for a week or so, reaching No. 70. The song has also appeared on at least a dozen Stones albums and compilations. Billboard rated “Paint it Black” No. 21 on its list of the 100 top songs of 1966. But beyond the conventional record business, pop chart performance, and awards, “Paint It Black” has also found its way into a number of other uses, particularly in film, television, and video games. These uses have kept the song very much alive and well for many years beyond the 1960s. The ‘Tour of Duty’ TV program, late 1980s, used ‘Paint It Black’ as its opening theme song. Later packaging of ‘Paint It Black’ with red banner corner note that reads: ‘As Featured on the TV Series Tour of Duty’. In the late 1980s, “Paint It Black” became associated with the Vietnam War due to its use in both Hollywood films and TV shows. It was used in the ending credits of the 1987 film Full Metal Jacket and it also became the theme song for the CBS-TV show, Tour Of Duty, a Vietnam war era series that ran from 1987-1990. The airing of the song on the TV show especially — which played around the world — contributed to the song’s revised popularity in the late 1980s-early-1990s. In May of 1990 in the Netherlands, after “Paint It Black” was re-released there as a single again, it hit No.1 on the Dutch Top 40 chart. Later marketing and packaging of the song in those years also referred to the Tour of Duty TV show. “Paint it Black” was also used on the NBC-TV show American Dreams in a 2004 episode when a central character in the show — young J.J. Pryor from Philadelphia, PA — goes missing in Vietnam. The song’s other film appearances, either in its original or cover versions, include: 1997’s The Devil’s Advocate, a thriller/horror film starring Keanu Reeves, Al Pacino, and Charlize Theron; 1999’s For Love of the Game, a film about baseball with Kevin Costner; and, Stir of Echoes, a supernatural thriller, also in 1999, starring Kevin Bacon. On television, “Paint It Black” has also had more recent uses, as in a July 2003 pilot episode of the cable TV show Nip/Tuck — a show described by New York Times writer Alessandra Stanley as “a ‘Miami Vice”-style drama about two dashing and unscrupulous plastic surgeons in South Florida.” In the pilot episode, as a facial reconstruction takes place, “Paint It Black” plays on. Cover versions of the song have also been used in a number of other TV shows and films. Writer Stephen King has used “Paint It Black” in his Dark Tower series of novels; the song is heard by several characters as they pass the same music shop in New York at different time periods. Janet Fitch’s 2006 novel Paint It Black is named after the song, and uses the first four lines from the lyrics as a quote preceding the first chapter. ‘Paint It Black’ is one of the songs used in this popular ‘Guitar Hero’ video game. Oct 1989 edition of Forbes business magazine featuring Mick Jagger & Keith Richards. Click for story. In any case, “Paint It Black” has had a long and varied career since it was first launched in May of 1966. In 2004, the song was ranked No. 174 on Rolling Stone magazine’s list of the “500 Greatest Songs of All Time.” But sadly for the Rolling Stones, “Paint It Black” is one of the tunes they no longer control; losing rights to the song during their younger years. In a legal settlement with an earlier manager named Allen Klein, the Stones relinquished their publishing rights, along with lucrative royalties, to this song and others. In 1965, Klein, a New York manager also involved with other rock groups, had helped the Stones negotiate a new contract with Decca Records, then winning the group their first million-dollar payday. But in the process, Allen Klein also helped himself. His company, ABKCO, still retains the rights to the Stones’ early songs from the 1960s to 1971. 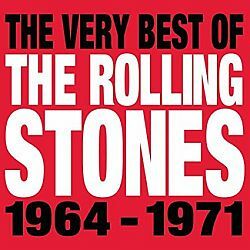 A CD compilation of Rolling Stones top hits, 1964-1971, by ABKCO Records, 2013. “Paint It Black,” Song Facts.com. Alessandra Stanley, Television Review, “Snipped, Implanted, But Short Of Perfect,” New York Times, July 22, 2003. Richie Unterberger, “Paint It Black, Rolling Stones,” Song Review, All Music.com, as of February 2009. I. Barry D’Paul, comment to the New York Times, October 30, 2008. Jack Doyle, “Stones Gather Dollars, 1989-2008,” The Pop History Dig.com.